Eating too much salt is unhealthy for both children and adults. Children who eat higher levels of salt have higher blood pressure, and this can continue into adulthood, where it increases the risk of heart attack and stroke. Higher salt levels are also linked with worsening asthma and increasing the risk of osteoporosis. How Much Salt Should Children Have? These are maximum levels – it’s perfectly healthy for children to have less salt than this. Food cooked for children (or adults as well) shouldn’t have any salt added to it – as children get older, add flavour to food using spices and herbs. Not adding salt to cooking may make the food taste bland at first, but after a while, the need for salt will drop. 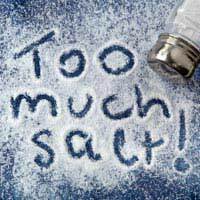 Don’t have a saltshaker on the table – many adults add salt to their food out of habit, and children will copy this. About three-quarters of the salt in the diet comes from processed food. This can include foods that don’t taste salty, including cereals, bread and sweet foods like biscuits, cakes and muffins. Choose lower-salt versions or no added salt of food, such as baked beans, pasta sauces and tinned vegetables. Many manufacturers are reducing the amount of salt in their foods, but the levels may still be high. Food packages should be labelled with the amount of salt – this may be listed as ‘salt’, ‘sodium chloride’ or just ‘sodium’. If the listing is for sodium, this needs to be multiplied by 2.5 to get the amount of salt. Check whether this is per pack, per portion or per 100 g (and some portion sizes are really rather small, which makes the salt content look rather low), Some packages may label the salt content as ‘high’, ‘’medium’ or ‘low’, or have red, amber and green traffic light labelling. Which is Better: School Meal or Packed Lunch?